While you have already seen the breakdown for this question in the previous post. I need to show this again to include with these results too. So to recap, in Fig 1 (below) I have compiled a split pie chart breakdown. I have added the agree 38% and strongly agree 58% results together, totalling 96%. 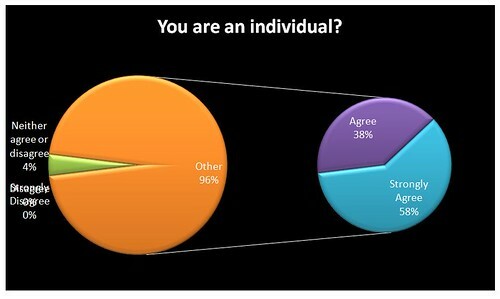 It appears that the majority of people think they are an individual, though 20% more, strongly agree than others. In fig 2 (below) I have added the agree and strongly agree results together, totalling 85%. 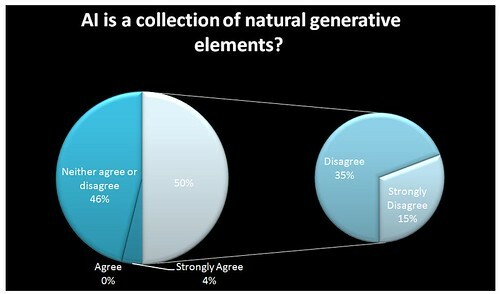 While 15% neither agree or disagree, so the majority of people agree that they are a collection of natural generative elements. 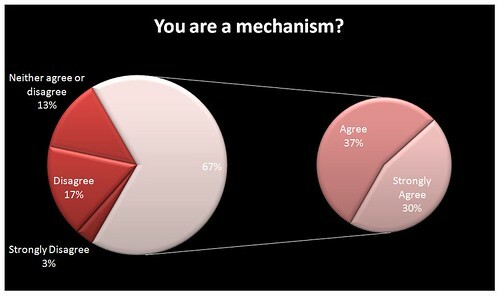 The combined results of Fig 3 (below) are 67% think they are a mechanism. 17% disagree, while 13% neither agree or disagree. It appears that most people think they are a mechanism. 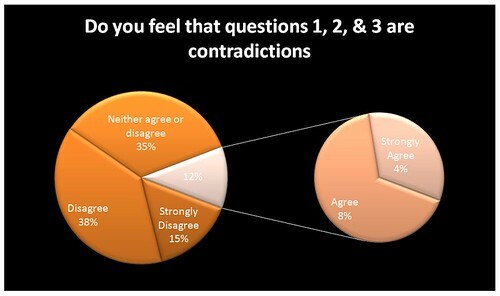 In Fig 4 (below) 12% thought that questions 1,2 & 3 in the questionnaire were contradictions. While 38% disagree and 15% strongly disagree totalling 53%. While 35% neither agree or disagree. It appears most people think that the first 3 questions are not contradictions. Are you an individual? 96% of people agree on this. 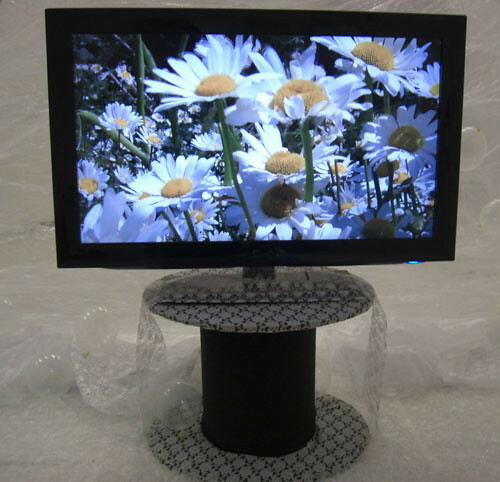 Are you a collection of natural generative elements? 85% agree on this. Are you a mechanism? 67% agree on this. Do you feel that questions 1, 2, & 3 are contradictions? 53 % think that they were not contradictions. It appears that most people consider themselves an individual, a collection of natural generative elements, a mechanism, and that these are not contradictions. I have left questions 7 & 10 of the questionnaire to breakdown last as I noticed that the main differences between a human and an AI are actually more noticeable in the results from these questions. First see Fig 5 (below). 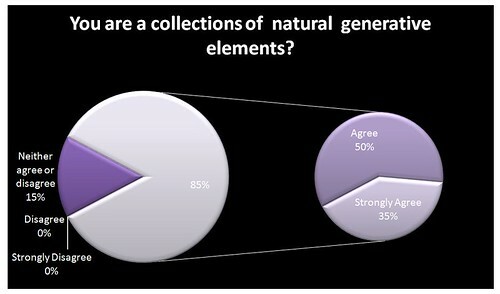 Here you can see that 35% disagree and 15% strongly disagree that an AI is a collection of natural generative elements, these figures totalling 50%. While 46% neither agree or disagree and 4% strongly agree. 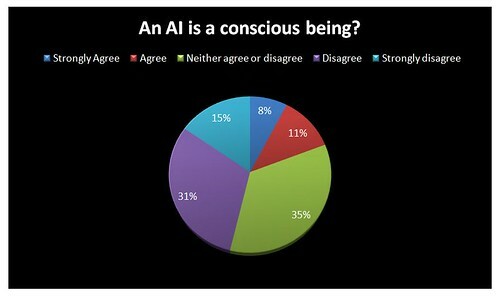 These results are also very similar to the results from the question - There are valid reasons why an AI is not a conscious being? In the breakdown in fig 6 (below) 31% agree, 15% strongly agree totalling 46%. While 38% neither agree or disagree, 8% strongly agree and 8% agree. These results are very similar to Fig 5, (above) and I am wondering if there could be a correlation? 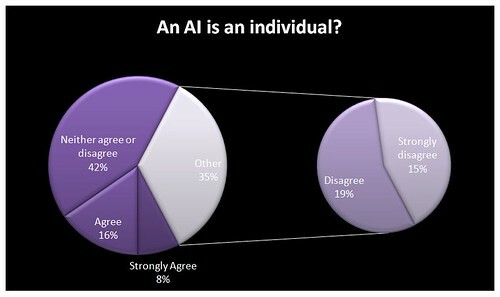 Looking at these results there may be a connection why people are so indecisive about AI's in the other questions, shown in the breakdowns of research in part 1. 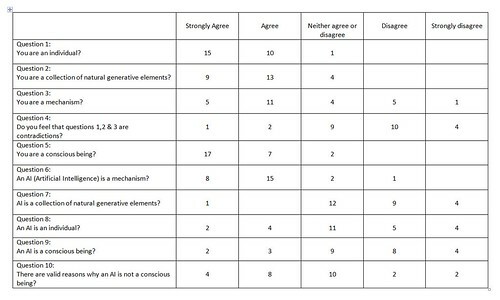 Since 50% do not think an AI is a collection of natural generative elements, and 46% think that there are valid reasons why an AI is not a conscious being. Could question 7, (fig 5) actually be an important link to why people are so indecisive regarding the other questions about AI's. So if people thought AI's were a collection of natural generative elements, would this make a difference to whether an AI would be considered a conscious being? 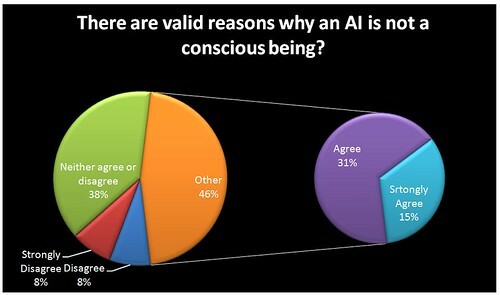 I would like to know the reasons behind this, along with why 46% think that there are valid reasons why an AI is not a conscious being? While it may appear that there could be a correlation, this may not equal the causation. However I found it very interesting doing these breakdowns to compare the results, which is something that I would be interested in researching further within my artwork. Following on from my previous post on Feedback from questionnaire I have since composed some split pie charts to compare the results of how people considered themselves to be a individual and a concious being, to how people compared an AI to an individual and conscious being. I chose these questions to look at in more detail as these results initially sprung out at me which I found quite interesting. In Fig 1 (below) I have compiled a split pie chart breakdown. I have added the agree 38% and strongly agree 58% results together, totalling 96%. 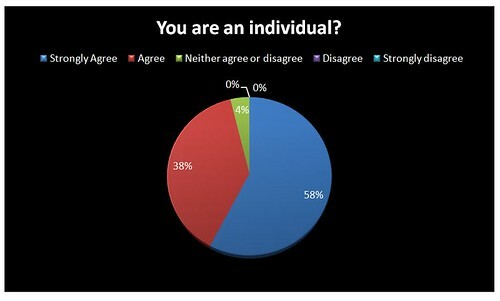 It appears that the majority of people think they are an individual, though 20% more, strongly agree than others. In Fig 2 (below) I have added the disagree and strongly agreed results together, totalling 35%. While the agree and strongly agree results combined equal 24%. The majority result is 42% which is neither agree or disagree. 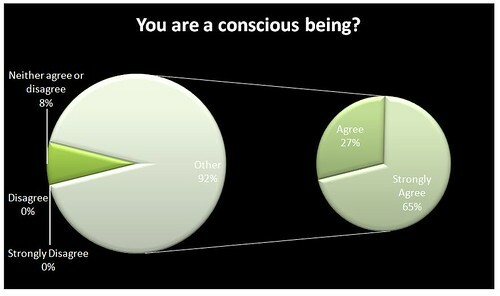 The combined results of Fig 3 (below), are 92% think they are a conscious being? 8% neither agree or disagree, 0% disagree and 0% strongly disagree. 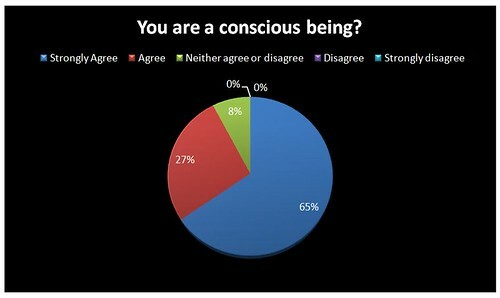 It appears most people think they are a conscious being. 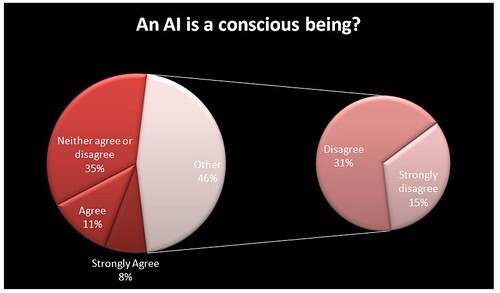 While in Fig 4 (below) 47% disagree that an AI is a conscious being, 35% neither agree or disagreed, 8% strongly agreed and 11% agree equalling 19%. So basically the majority of people that took part in this questionnaire think they are an individual and a conscious being? 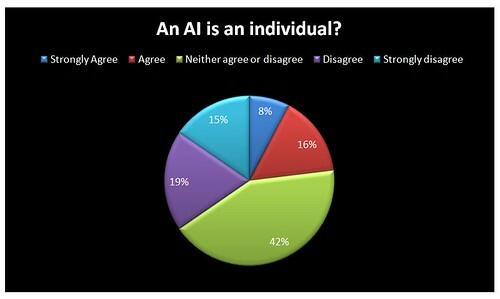 However it was quite interesting to see the results when referring these same questions about an AI, as on the whole most people neither agree or disagreed, which I found interesting. In my next post I will do a breakdown of the rest of the questions. Personally I dislike likert style questionnaires so I was really hoping that people would make comments too, though I didn't tell them this. I wanted to explore these ideas and see how many people felt the need to make comments as there were so many 'ifs and buts' in this questionnaire. This was quite risky because if people hadn't make any comments I would not have gained any qualitative research, but my curiosity took the better of me. It has been so interesting to gather information via both the questionnaire and also to hear people's views and their interpretation of the questions from the comments that I have received. Last 3 Q's difficult to go one way or another. An AI may be an individual, but also may not be. 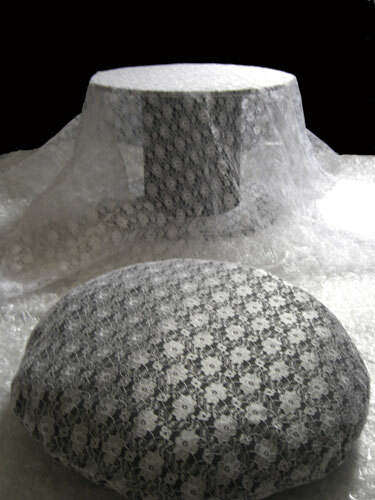 As it is artificial it could be copied and so there could be many AI's with starting parameters that are the same. 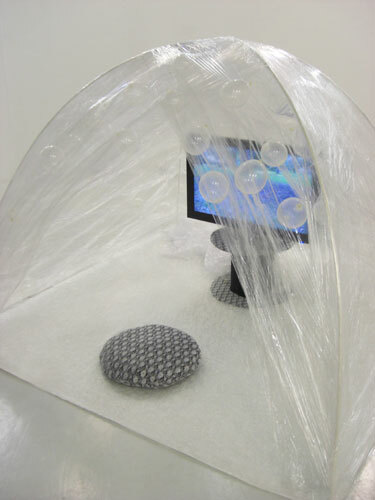 It would depend on whether it has the ability to self-adjust itself over time as it experiences things. Some AI's may be conscious does not mean that all AI's are conscious. I really like your idea for the AI 'traveller' which has chosen its own shape as the air tent. It's fun. The video was great too. I liked the sound of the breathing with the footage. I've filled out the questionnaire, but I thought I might explain my answers a little. I'd say we're all individuals, a collection of natural generative elements AND mechanisms. We're a mixture of the individual and a collective network of life on the planet I reckon. But we have a choice whether to believe this or not. I don't necessarily think that being all 3 is contradictory, I think we have different layers and functions of our physical, mental and spiritual/conscious selves. Our physical makeup is a biological/organic machine, but we have consciousness, awareness, sentience etc etc. So that we are not just mechanical, although even thought can become mechanical via programming/ conditioning etc, but I think thoughts and feelings are generally more spontaneous than just to be purely mechanical. My answers about the AI aren't simply 'disagree or agree' answers really. I think the potential and abilities and perceptions of AI can differ greatly. In terms of programmed basic non-sentient AI; these to my mind are mechanisms that are programmed and controlled by an outside force (ie man), and do not have the ability to be self aware, to feel or understand other organisms different to them. Like a chess machine, a sophisticated computer etc; there is AI and logic there, but not independent thought and the ability to go out into the world and experience new things that cause changeable ideas, thoughts, feelings, evolution, survival, growth etc. Whilst every separate thing that is created is individual in its physical self, true individuality derives from the ability to be unique and question, and a basic programmed AI doesn't really have this ability. The AI could also potentially be able to reproduce if it was made up of organic material either with a partner or asexually, or an abstract way, it could reproduce digitally if it was a computer/ digital lifeform if one day this was possible....I don't see a clone as an AI though, because it's not artificial in itself, rather the conditions it was created in were not 'natural' in terms of how a species would reproduce and be grown inside the womb. So I wouldn't class a clone as an AI, because to my mind it's still a sentient individual. But a cyborg or android or some kind of sophisticated computer or organic creature not yet realised, which had the spark of consciousness in it's brain might be an AI; something that was constructed/created by another but which is able to react and think for itself and learn (and so becoming an individual; not just purely a construct or machine). I hope that waffle helps and is useful to you in some way, even if it's just to see how my mind reacts to the ideas at this moment in time!...I hope it makes sense too! What fascinating questions! Scientific advances are exciting even though I feel more and more like a Victorian these days with all this micro-technology at our disposal. I'm sure we're going to see AI's playing an increasing role in our lives. I liked your marquet and the materials you are using. Your ideas are very well thought out. I thought your video posed the questions in a quietly persuasive way. The breathing sound and imagery combined to help me unclutter my mind and focus on the questions too. The pace of the video was perfect. I loved the sparks and daisies in particular and the waves worked well in tandem with the breathing. Overall I thought it had a primeval feel which underlined the gravity of the issues you are asking us to consider. For instance, one reason why I like living by the sea is because it's where we originally came from and I find that quite grounding. The way the breathing became more insistent when the "Are you a mechanism?" caption came up was quite disquieting and very effective. This is an excellent piece of work Kay. It had a powerful effect on me. Thank you. Great work, Kay. Only us living creatures - including non-human animals, are conscious beings. Well, that's what I think. Not sure I understood all the questions, but I've had a go anyway. Liked the video clip and the step by step clear instructions. I think I see where this is going, but there are semantic ambiguity problems here. In 3 the term "mechanism" is overloaded. To many it will mean a machine that is manufactured by the hand of man, to others it will mean something that is in accord with a mechanical universe. 7 seems to be an obvious but purely definitional question. Anything "artificial" is not "natural." The only problematic case would be something like Frankenstein where natural parts are artificially stitched together. But that's not usually what people think of as an AI. 8 also has a similar overload problem. Individual might just mean a counting unit, i.e. if in a package there is only one X then it is an individual X. Or it might mean individual in the sense of their being unique and different from the others. i.e. there are many X's but each is different and thus each is an individual. In 9 it depends on the AI I suppose. I can imagine inventing something that could be called an AI but is not conscious. I can also imagine one that is. But so far neither has been achieved. Trippy video with the breathing and imagining it in this AI dome. There are parts of a person which react like a mechanism in that with the same conditions and external factors you are likely to get the same changes and results, but this does not make you a mechanism. I'm not sure about the answers!, well for some, need to read up more on ' natural generative' with regards to AI, I'm not sure of the boundaries of the definition of 'natural generative', I'm pretty sure that AI wouldn't come in to it; but I saw 'Demon Seed' years ago & Proteus 'mates' with a woman & has a child at the end. So gonna think a bit more on my answers. Right, I've done the questionnaire!, I put neither agree nor disagree, because I think their conciousness & functioning depends on their 'spec' or the capabilities of the AI when designed & created, I think. I shall be thinking about these things like conciousness & what it means to be 'alive'. I think about these things in relation to The Romantics & Mary Shelleys Frankenstein, which had such an impact on me. There is the quote ' I think , therefore, I am' by Descartes. I remember being shown a picture of a mechanical doll or automaton in a museum ( perhaps France) with those words on a small placard in front of her. Fascinating, beautiful and thought provoking stuff. I would love to come and experience this when it is done if the opportunity arises. Looks really great. Really interesting work Kay. I hope I can make it to your show so I can experience The Traveller! The prototype look amazing. Have filled in questionnaire and was quite in a dilemma as one of my favourite films is Blade Runner and another that I found really quite unbearably sad was Artificial Intellegence but my answers do not reflect that! Yes - whats all that about! Liked the video Kay, very clever....the breathing! Regarding the questionnaire, I would have had a lot of qualifications to the answers to these questions such as 'that would depend on…' 'it could be… ' etc. So I did my best. Some of this depends on what you mean by terms such as 'mechanism', since this could be used to describe either 'mechanical' systems or 'organic' ones. Anyway, hope its a help. Totally Impressed Kay, I'd love to come to your show. It has been really fascinating seeing both the results and comments, but I did find the results from the Pie charts to be quite surprising mainly due to the neither agree or disagree comments. I was really pleased to receive comments on this to understand how people were thinking. I will be reflecting and breaking down the statistics in a later post.